Mary has gone from a devastating incidence of robbery at her m-pesa ( Mobile Money banking business) to a new thriving business. In 2008 Mary had a m-pesa and a beauty shop that were thriving until one evening when her business was robbed. After the devastation she worked different jobs for a few years until 2014 when she decided to start a new business. Mary decided that she wanted to open a shop selling bike parts, auto parts, and beauty supplies. Even though the auto and bike industry is extremely male dominated Mary began to explore where she could buy goods to supply her shop and began planning where to open it. So with the help of a loan from Opening Village Doors Foundation and some money she had saved, she started over and opened her shop. As we visit her today, Mary’s shop is doing well, she has a good amount of clients and the word of mouth marketing about her shop is spreading. Thanks for donors who support Opening Village Doors Foundation, her business is doing good, she has a good income to support her family and she can make her loan repayments on time, and Mary has plans on how she would like to grow her shop by adding food items, and some expensive spare parts that she is not currently able to stock. Near the end of our visit Mary thanked Opening Village Doors Foundation for supporting her. She described how banks will not give loans to small businesses like herself because they are only interested in large businesses in order to have large profit. She appreciates the follow up visits done by Opening Village Doors staff means to her as they motivate her and helps keep her accountable. The work of Opening Village Doors would not be possible without the generosity of those who support our mission. Thank you to all those who have shown support in the past and still do, if you would like to donate to help Mary and those in similar situations start their businesses and be able to support themselves you can click on the link bellow. No gift is ever small. When we arrived at Kamuzu International Airport, we were greeted with friendly smiles and welcoming voices. Though the airport was simple there was a abundance of warm hearted people that guided us into Malawi. It is the same treatment that we received as we drove to the country side, heading to the district of Mangochi. As we climbed in elevation through the mountains the air turned fresh and cold, as if welcoming us to the warm coastal weather of Lake Malawi. Our visit to Malawi was an invitation from Warm Hearts Foundation which has been working in Malawi for over a decade. They wanted to partner with Opening Village Doors Foundation to provide micro-lending to empower women in the district of Mangochi. Warm Hearts Foundation liked the OVDF micro-lending model in Kenya- to directly engage individuals ready to start income generating projects. Once these individuals have shown an interest, we work with them to develop a business plan, provide training, and give starting capital and mentorship. The ultimate goal being to walk alongside those who we support so they can succeed in business and in life. During our visit we had the opportunity to meet some of the 12 business women that the two organizations have been able to partner with. The businesses are located in the Mangochi Market. This market is open seven days a week and encompasses a multitude of goods, such as, fresh fruits and vegetables, grains, beans and other things. Anything you could want can be found in this market, it is a busy place full of activity and trading. In the market we found Gloria, who operates a stand of fresh fruits, vegetables, and spices. She captures the essence of this partnership as she remarks that “ …before this, I did not have a way of paying for my child’s education, healthcare or meeting basic needs, now, I am able to pay tuition for them in the private school and I am able to support my family”…she then added, “thank you so much for your support”. Gloria’s story is not unique for these 12 business women, her statement encompasses how all of them feel about the new opportunity. As we end our visit in Malawi we are reminded of the African proverb that states “…one hand cannot take cows to the river by itself…” meaning, that in order to fight poverty through business start-ups we need the support of donors, staff and volunteers, who value our mission and vision so those we work with can thrive. Every entrepreneur wants to be associated with a successful businesses; Mpesa is just one of them. Since its Launch in 2007 by Safaricom and Vodacom, MPESA has been considered a global success. Researchers show that more than two Thirds of adults in Kenya use MPESA for their transactions, this research further states that MPESA does about 8 million transactions daily. Mpesa can be used for Shopping, Utility bills, Taxi ride, Deposits and many other uses. Currently Mpesa has about 85,000 agents countrywide and Janet Gesare is one of them. Janet completed her education, where she studied early childhood development. For a few years she followed her career path and was teaching in one of the private primary schools within Ngong where she earned 6000Kshs ($60) monthly. This, she says was never enough to sustain her and the family as the standard of living is very high. Janet bought the MPESA business from her uncle. Though she did not have enough starting capital as her uncle withdrew all his money from that business line. She struggled since she had not enough float ( money required to maintain at hand to pay customers) but had made so many clients. Early last year, Janet was introduced to Opening Village Doors Foundation by one of our very loyal client, Jacklyn; she then visited our office to find out more about our business model. She applied for a loan of 50,000Kshs in order to boost her business. She also received training on managing her business and successful ways to engage customers. When we visited Janet in February 2017 she could not hide her happiness. She invested the funds in expanding her MPESA business and added drinking water which she sells at 100% profit and being that her shop is centrally located in a petrol station and also near a garage, she sells up to four boxes of water dally. Currently her MPESA is also doing very well. In fact she wants to clear the loan as soon as possible and apply for more to expand her business even further. 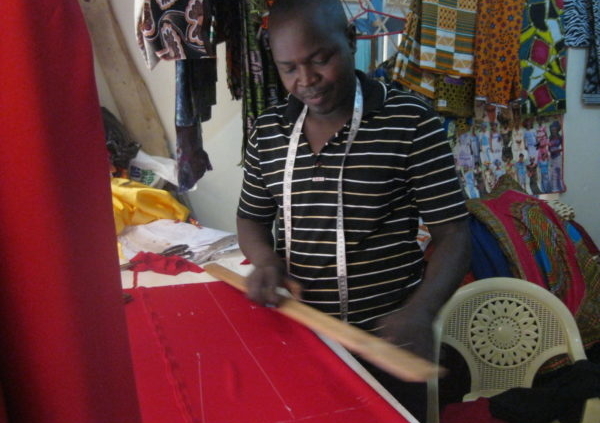 Peter Onyango Aguro, aged 31, a farther of three children, one boy and two girls aged 8,5 and 1 respectively, is a well known tailor in Ng’ong town. He has done tailoring for almost a decade now. He says his greatest inspiration was his Uncle, who taught him all the basics of tailoring. Peter says he exists because of his business, it is from his his sweat that he is able to he pays rent, school fees(tuition) and still puts food on the table for his family. Peter used the funds to add two sewing machines one for Ksh. 25,000 ( $250, and another for Ksh. 15,000 ($150. One of the machines he bought was electric, which increased his productivity thus meeting customer deadlines without any problems without loosing opportunities for new orders.The rest of the money he used to add more sewing material. When asked how things are progressing for him, he stated, the loan and mentorship that he has received from Opening Village Doors Foundation has given him so much confidence with his work and given him stability and an assurance that for sure he can sustain his business for many years to come. Peter is very grateful to Opening Village Doors Foundation and plans to work very hard to pay back his loan so that others can also have an opportunity. He plans to employ one or two people to expand his business. One of his dreams is to help others learn the skill of of tailoring, with time he plans to start identifying young men and women interested in the work and teach them just like his uncle had done. Thank you for making Potential. Possible! In a nice single room, a lady stood busily braiding a young customer’s hair as they engaged in a serious conversation spiced with laughter. You could tell the conversation was friendly and the relationship built between them was cordial and respectful. On the shelves of the room were well-organized beauty products, a picture of the president of Kenya, and the business license from the county government. The eyes turn to us as we enter the room and it’s all smiles as she motions us in, saying karibu…. welcome to the Jackline Wanjiru story. Jackline Wanjiru Mwangi is the first-born daughter in a family of three children. She began attending high school, but was unable to finish her studies due to financial difficulty; her family could not afford the tuition. To make ends meet, she began working as a day laborer, doing any jobs that she could find – mostly manual labor – to help support her parents and siblings. One of these jobs she got was to clean a salon. Over time, she acquired the skills of salon work and enrolled herself in classes to learn to style hair. Eventually, she was employed as a hair stylist in a salon, and she worked like this for some time before she saved some money to be able to afford to buy a blow drier. She approached Opening Village Doors Foundation and sought help, asking us for a loan of 30,000 shillings – approximately $400. With the money OVDF was able to provide, Jackline purchased a stock of salon supplies and a second blow drier, and began her career, opening Shiku’s Salon. 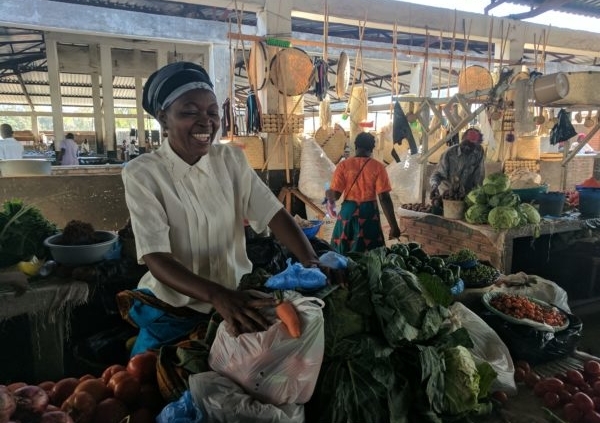 Jackline’s business has steadily grown since then, and she has never missed a single payment – she will fully pay off the initial loan this coming August, two months from now. She now has two full time employees working for her! Throughout the whole process, Jackline has supported her siblings, a brother and a sister, through their studies in high school, helping her family to pay their tuition so they will not be forced to follow the same path she had to walk, and they might be better prepared for their own futures. Jackline hopes to continue to expand her business and plans to keep working in the salon doing what she loves, thanks to her diligence, determination, ambition, and a little start-up help from Opening Village Doors Foundation. Thank you for making Jackline’s dream come true! Join us to make more stories possible. 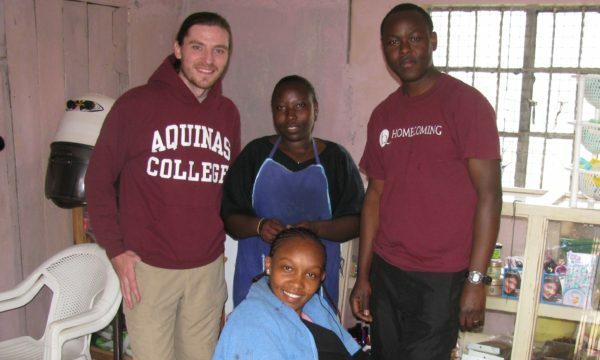 Lucy is a mother of three children, a girl and two boys, she resides in Ngong, Kenya. She is the backbone of the family when it comes to financial support. Lucy used to run a small business but fell on tough times and used the funds to support her family needs. When she wanted to start again, she went from bank to bank seeking for a loan but she couldn’t, as she didn’t have any collateral. She was sharing her frustration with a close friend when the friend referred her to talk to Opening Village Doors team in Kenya. Lucy received starting capital of $375 to start a poultry farming business. She rears one-day-old chicks and at four months old she sells them to local restaurants and cafes. When asked if there is market for it, she smiles and states “I have already organized with a local restaurant and they have an order ready to go once they are ready.” She bought 200 chicks with the funds and is now counting days and praying that all goes well. Her plan is to pay back her small business loan and request a bigger loan to increase her business. The profit she makes she uses to pay for her kids tuition and meet family obligations. Opening Village Doors staff Ascar has visited her home twice to see how things are going and to mentor her and answer any questions that she has. She also meet with her group for moral support and supporting other ladies who are also running their own businesses. There are 15 individuals in her group each with her own business. Will you empower another family with a business? Donate today! https://openingvillagedoors.org/wp-content/uploads/2013/10/Kenya-Warm-Hearts-kids-6-17-11-002.jpg 1708 4272 Opening Village Doors https://openingvillagedoors.org/wp-content/uploads/OVDFLogo6Asset-6.svg Opening Village Doors2013-10-26 19:12:562018-11-19 17:37:54Empowering with a business! In Kenya, we partner with individuals to start businesses so that they can provide for their families and educate their kids-both boys and girls. Over 98 percent of those that we have empowered to start small businesses are women; it is our plan to see them thrive so they can be role models to their children and the society at large. Join us and others who are working on removing barriers to girls’ success! Global economic activity remains subdued, and despite signs of strengthening in high-income countries, significant downside risks persist. Economic activity remains strong in much of Sub-Saharan Africa, underpinned by robust domestic demand. The economic outlook for the region is positive, although the region is vulnerable to both a sharp decline in commodity prices and the fragility of the global economy. More than a decade of growth has helped to lower poverty, but the twin goals of ending extreme poverty and boosting shared prosperity call for a sharp ramping up effort. A low growth elasticity of poverty means that growth alone will not suffice to rapidly reduce poverty in the region. Accelerating Africa’s poverty reduction will also require more inclusive growth processes and tackling inequality. Despite the continent’s growth turnaround and progress in the fight against poverty during the last decade, poverty in Africa remains unacceptably high, and the pace of reduction unacceptably slow. Almost one out of every two Africans lives in extreme poverty today. Optimistically, that rate will fall to between 16 percent and 30 percent by 2030. Under any plausible scenario, most of the world’s poor people by that date will live in Africa. Sustained growth is necessary—but not sufficient—to meet the challenge of accelerating poverty reduction in Africa. Visit out website and find out more how we are fighting poverty in Kenya through helping individuals start small business so that they can generate income to support themselves and their family and create employment. On October 1st, the president of the World Bank, Jim Yong Kim called for a “ social movement to end poverty” and declaring that “we can end extreme poverty by 2030”. The speech highlighted a shifting change and recognition that the bank and all of us need to “partner with the private sector to use their expertise and capital to fight poverty, invest in women and girls and the youth in general to change villages, communities and reducing and eventually eliminating poverty. Opening Village Doors has embarked on this journey. We have funded start up of 32 small businesses that generate income that supports over 300 families directly. In the coming year, we plan to increase the number of small businesses to over 150 so as to support over 1000 families directly to get out of extreme poverty with dignity and respect.